I am so lucky to do what I love on a daily basis, and I want new clients to feel comfortable coming into my studio. Read client testimonials of what my past clients had to say about working with me, and if you have any other questions, would like a studio tour or are ready to book your session, contact me today! What a great experience! Very patient with both my 3 month old and 5 year old. Nice studio with loads of props and very easy to find! I recently came into the studio for a photo session with my 3 month old son. I was so impressed with Allyson and her assistant Sheila; they were professional, creative, and made the session tons of fun! They worked hard to capture the special moments on film that we will cherish forever. 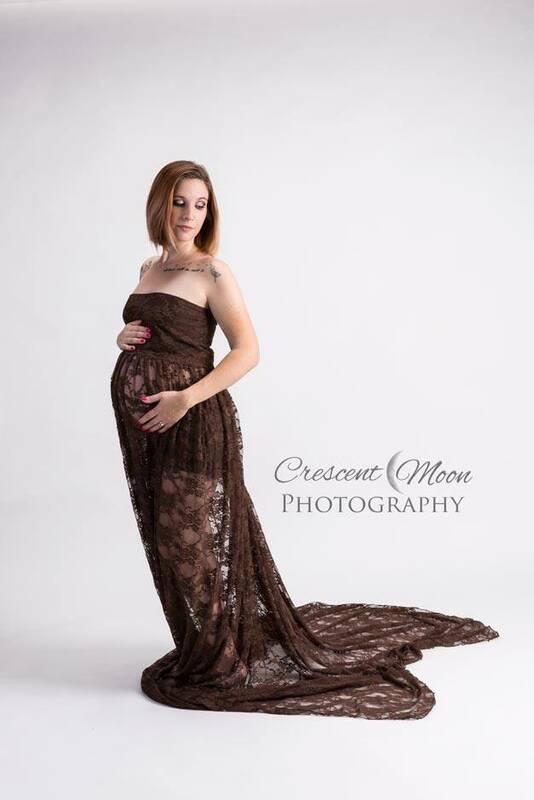 I highly recommend Crescent Moon Photography for any of your photography needs! I would highly recommend Crescent Moon Photography! I had my maternity pictures done and they made me feel very comfortable and beautiful. Allyson also had my daughter help out with things and she hasn't stopped talking about it. I cant wait to have my son's newborn photos done! If you are looking to have photos of your family or pets this is absolutely the place to come! Allyson took my son's 1/2 birthday pictures today and they were amazing with working with my lil guy and extremely patient with my 2 toddlers who waited for their lil brother:) I can't wait to come back for 9 months and the BIG 1 thanks so much for my beautiful pictures!! Super cute studio with good parking, so easy to get to! Lots of awesome props throughout the studio and Allyson is so easy and calming to work with. Allyson is amazing at what she does. What a great experience we had with her. She was very gentle and caring with my son, and it really showed in his expression. Thank you Allyson for an amazing photo shoot. We first met Allyson at a Santa photoshoot for our beloved pug and our new puppy... From there, the passion for her work was obvious. We did not recieve a flimsy mall type photo for our pictures with Santa, we received beautiful prints printed on an impressive quality material. From there we knew we wanted Allyson to capture the love we had for our eldest 14 year old dog, which she did perfectly in her beautiful studio. That same day we surprised Allyson and asked her to photograph our pregnancy announcement, which she did flawlessly without hesitation. Our baby has since been a newborn model for Allyson to help Allyson showcase her talent and we have been very pleased with the photographic results. Each session is like meeting with an old friend and Allyson not only gets great pictures she also shows love, patience and compassion for her work. The attention to detail Allyson displays not only with her work, but also making sure her studio is newborn friendly complete with a changing area is remarkable. We would highly recommend her service and we are delighted to have the milestones of our baby in print!